As a young apprentice in medieval India, Shah Hussain was struck by the idea of this life as a 'game and sport'. The poetry he went on to write still holds a light to the darkness we carry within us. Lahore, the ancient city of Loh, the age-old halt for invaders, is also the home to eclectic Sufis. Men and women who shed conventions and discovered newer planes of spirituality found a home in this city. The merging of centuries' old Indus valley bastion - the Punjab and its primordial language - with core strands of Islamic Sufism was a unique moment in South Asia's cultural evolution. And, no one can better represent the composite soul of Lahore than its poet and Sufi master Shah Hussain, whose identity has forever fused with his Hindu disciple Madhu Lal. 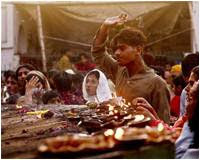 Those who seek Lahore's Mela Chiraghaan or Festival of Lights still frequent the 16th century shrine of Madhu Lal Hussain. Shah Hussain's father, Shaykh Usman, was a loom weaver, and his grandfather Kaljas Rai (Kalsarai) was a convert to Islam who gained the confidence of the state during the reign of Emperor Firoz Shah Tughlaq. Shah Hussain Lahori was born in 1538 AD near Taxali Gate, Lahore. His early religious education was followed by induction into the Qadiriya order by Hazrat Bahlul Daryavi at a very young age. As a devout Muslim in his early years, he gained a formal outward knowledge and imbibed the spiritual moorings of Lahore, including the blessings of Hazrat Usman Ali Hajvery, aka Data Saheb, whose shrine has guided scores of saints, fakirs and yogis for nearly a millennium. Mythological accounts suggest that at the age of thirty-six, while studying a commentary on the Quran, Shah Hussain was struck by a line which equated the 'life of this world' to 'game and sport.' He asked his instructor to explain the concept but his teacher's response did not satisfy him. He is said to have interpreted this verse as a means to undertake sport and dance. It is said that Shah Hussain pursued dancing, sport and frolicking but his mentor Hazrat Bahlul Shah Daryavi was not alarmed as he thought his student was spiritually intact. A life of questioning and seeking alternative meanings in conventional beliefs had arrived. This turning point in Shah Hussain's journey proved to be a major milestone. The first step was to question the clergy and the religious establishment that was co-joined with the monarchy in medieval India. Muslim rulers had sought refuge in religious legitimacy to entrench their dynasties, and in divine right to rule a mass of infidels. Sufis such as Shah Hussain were rebels against the established power-cliques and this is why they gained a huge following across religious, sectarian and caste divides. Let the people say, "Heer is crazy; she has given herself to the cowherd." He alone knows what it all means. Oral histories suggest that Madhu Lal's parents wanted him to accompany them for a ritual bathing ceremony at Hardwar, but Shah Hussain did not allow him to go. When Madhu's parents reached Hardwar, Shah Hussain made Madhu Lal shut his eyes, strike his feet upon the ground, and then open his eyes again. Madhu Lal did as he was told, and to his and his parents' utter amazement, found himself in Hardwar. Madhu Lal along with his parents later converted to Islam following this miracle. And popular belief is that the name "Madhu Lal Hussain" was bestowed on the young Brahmin. Madhu became the successor of Shah Hussain after the latter's death in 1599. Madhu Lal survived his pir for the next 48 years, and his tomb lies next to Shah Hussain's at the eclectic shrine today in Baghbanpura, Lahore. This shrine is the centerpiece of the annual Mela Chiraghan, or Festival of Lights, celebrated on the Sufi saint's death anniversary (urs). It was previously celebrated on the 22nd day of the Islamic calendar month of Jamadi-at-Thani, but is now celebrated on the 14th of Baisakh or on the last Sunday of March. It is the biggest religious festival in Lahore, and was considered the biggest public festival of the city until Basant occupied the slot. Nights swell and merge into each other as I stand in wait for him. and people everywhere call me crazy. My young flesh crept into creases, leaving my young bones a creaking skeleton. I play host to that unkind guest - separation. There is a universe of symbolism within these kaafis: the charkha (spindle) emerges as a metaphor for the wheel of spiritual journey and also as a symbol peaceful coexistence of humanity. More importantly, the weaver is the Divine force of Creation as well as an embodiment of the human desires and vicissitudes of temporal life. The folk tales of the Punjab such as Heer-Ranjha figure prominently in Shah Hussain's poetry. These kaafis also condemn violence as noted by scholars such as Salman Saeed (The South Asian, April 2001), the limits and boundaries of life's journey, and acceptance of mortality. Long before 'symbolism' was noted in literature, this Punjabi Sufi was weaving allegories and complex themes using simple and easily accessible folk symbols. The timelessness of these poetic celebrations have inspired a variety of singers from the maestros Ustad Nusrat Fateh Ali Khan and Abida Parveen to contemporary pop outfits such as Mekaal Hasan Band and Junoon who have rendered Hussain's kaafis with ease. Travelers, I too have to go; I have to go to the solitary hut of Ranjha. Is there anyone who will go with me? I have begged many to accompany me and now I set out alone. Travelers, is there no one who could go with me? During long nights I have been tortured by my raw wounds. I have heard he in his lonely hut knows the sure remedy. Will no one come with me, travelers? The lighting of lamps at the start of every spring is a metaphor for killing the inner darkness that we live with. By invoking spiritual light through love and self-knowledge, we can overcome ourselves and reaffirm our need to love and be loved. The urs of Shah Hussain is also an occasion for celebration. It defies convention and the religiosity of the Mullahs and allows for much festivity. Qalandars and mystics from all over the country congregate and indulge in dhamaals (dancing in a trance) which celebrate the love of Sufis for their Divine beloved and masters. Who have it in their lives. With no cart to carry away the sand.